With the original M-2 getting rave reviews, such as the four and half stars & ‘Guitar Choice’ award it received from Guitar magazine, the Farida M2E goes one better by including Fishman electronics. Everything that made the original so good has returned with the Farida M-2E Electro-Acoustic Parlour Guitar. The 1920s design is still in place with its small, but voluminous, body shape and all the delicious tone woods are still there. It’s this combination that has made the guitar so popular across the genres, from bluegrass fingerpicking to indie strumming. Now, with the Farida M-2E Electro-Acoustic Parlour Guitar, you can take your favourite guitar on stage with you the ability to hook up to an amp or PA system. Although favoured by blues players and fingerpickers the comfortable parlour shape of the Farida M-2E Electro-Acoustic Guitar is small enough to be enjoyed by beginners and smaller players who want the big sound of a larger guitar but find their dimensions cumbersome. The Farida M-2E Electro-Acoustic Parlour Guitar gets a lot of its great projection from the Canadian red cedar chosen for its top, which also gives the guitar its lovely warm tone. The mahogany back & sides adds tonal colouration to the guitar, with extra emphasis on the treble and bass. What’s more, along with the mahogany neck, this wood provides the Farida M-2E Electro-Acoustic Parlour Guitar with a rich resonance and woody sound. 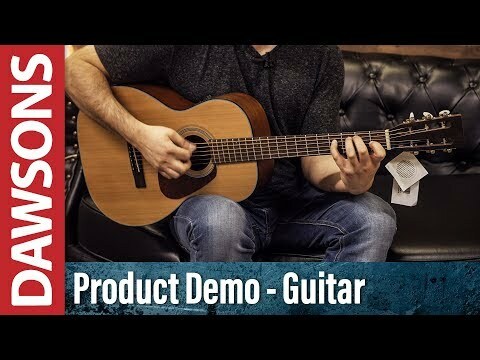 Although the choice of woods and the shape of the Farida M-2E Parlour Electro-Acoustic Guitar give it a bright tone and plenty of volume this new version of the popular M2 comes with the Fishman Isys T preamp system onboard. Along with allowing you to use the Farida M-2E on stage this pre amp comes equipped with low-profile tone shaping and phase controls, along with the obligatory volume control and low battery indicator. Also a handy little extra for the Farida M-2E Electro-Acoustic Guitar is the onboard tuner, negating the need to carry yet another accessory with you to gigs. Posted on 21/11/2018 by Colin Excellent service. I ordered on Monday evening and it arrived Wednesday midday. The courier kept me informed. The guitar exceeds my expectations. Great action, great tone and volume,quality build and excellent strings. It looks fantastic ( the illustration is too light in colour)...punches well above it's weight at so many levels. I've been playing ukulele for the last four or five years and decided to go back to guitar after a break of about 30 years. Just a perfect solution for an old has been :-). Need to get a cable so I can try it through a PA. I would say it would be perfect for a keen beginner looking at eventually trying open mic nights. Can't express how pleased I am ....thank you Dawsons. Posted on 07/05/2013 by Joey Owen I am all too aware that many reviewers get carried away with their ratings; usually the scores are either too high or too low. With this in mind, I thought I would give an honest appraisal of this guitar. I've had it for a while now, and it is very, very good. I expected a half-decent guitar at the price point, but I've been pleasantly surprised by the actuality. The guitar is well built, and the wood grain looks lovely. Despite this there are some blemishes, but these are minor and to be expected from a Chinese guitar. The electronics are a great addition and are a key selling point, the onboard tuner is accurate and the contour and phase controls add some depth to the tone when you are playing through an amp. The price is competitive, and the guitar delivers where many fall short. An extremely good choice for anyone looking for a smaller bodied guitar to take to live gigs.